We have created a petition over Public Health England’s 2014 narrow ‘Review of potential public health impacts from shale gas extraction’. It is now grossly outdated and hundreds of critical studies have been published since. 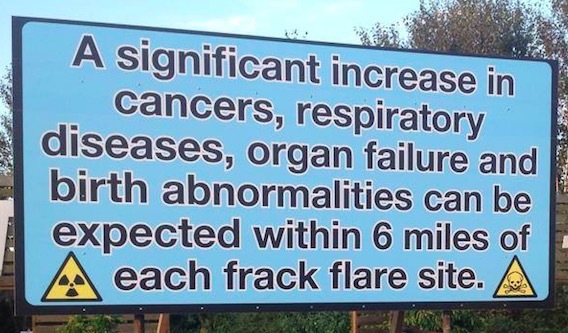 Public Health England must produce a new report on the potential health impacts on fracking in the UK. Until risks have been properly assessed, there should be an immediate ban on shale gas exploration and development in the UK. In 2014, Public Health England published their final version of a health report on fracking. The report was narrow in its contents and missed out some significant health evidence that indicated hydraulic fracturing impacted upon public health. Since that report, hundreds of other health reports have been published with critical evidence that now needs to be taken into account before any shale activity should proceed within the UK. Medact have released two reports into public health and fracking, both of which have been ignored by the Conservative government. Medact said they have “called for a moratorium on fracking because of the serious risks it poses to public health. Fracking has already been suspended in Wales and Scotland because of health and climate risks and New York State has banned fracking because of the ‘significant health risks’. “The [Medact] report highlights the limitations of Public Health England’s report on fracking, including the fact that it was narrow in scope and failed to critically assess the adequacy and reliability of the regulatory system. “The arguments against fracking on public health and ecological grounds are overwhelming. There are clear grounds for adopting the precautionary principle and prohibiting fracking.” This letter was signed by 18 academic and medical professionals. More recently, an important study has been released by Johns Hopkins University linking fracking to an increased likelihood of developing asthma. If Public Health England are to fulfill their public duty and mission statement, then to not acknowledge and act upon the wealth of contraindications towards hydraulic fracturing, they could be in breach of their position and may face legal challenge. A full and concise article by Alan Tootill, with references on this subject, can be found here. This petition will be delivered in person to Public Health England. “PHE’s report focused on the potential public health impact of shale gas extraction as a result of direct releases of chemical and radioactive pollutants. It did not consider wider public health and socioeconomic impacts, but recommended these be considered during the planning process. “The report concluded that the currently available evidence indicates that the potential risks to public health from exposure to emissions associated with shale gas extraction will be low if operations are properly run and regulated. “PHE will continue to keep abreast of substantial new research into shale gas published in peer reviewed journals.